Aims: In the clinical education of recently qualified laparoscopic surgeons who have been trained only with simulation models, it is important to make them precisely localize the blood vasculature when conducting lymph node dissection in laparoscopic colectomy and gastrectomy. We developed a Doppler forceps with a foot controller that allows the detection of the blood vasculature from the perpendicular direction which has been difficult with conventional Doppler probes and that is designed for simple real-time guidance. Method: In clinical trials on thirteen laparoscopic colostomies, three laparoscopic gastrectomies and seven laparoscopic adhesiotomies of ileus, we have examined possibilities to localize visually imperceptible blood vessels. And by comparison to the conventional Doppler probes, the ratio of the difference in power output voltage and usefulness of guidance. And we measured the time from detection to next treatment. Results: On thirteen cases of laparoscopic colectomy, inferior mesenteric artery, left colic artery and sigmoid colonic artery were easily detected. In laparoscopic gastrectomy, the identification of the artery variation such as accessory hepatic artery was successful. The blood vessel detection was unaffected by the Body Mass Index (BMI) of the patients. Doppler forceps can not only detect any invisible vessels but also easily handle any intestine. 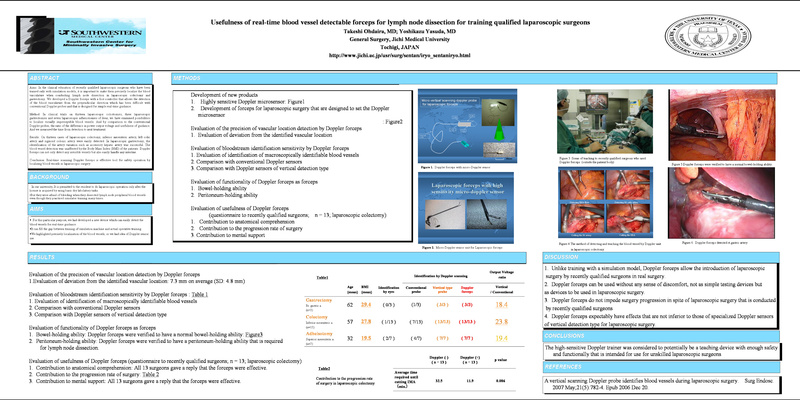 Conclusion: Real-time scanning Doppler forceps is effective tool for safety operation by localizing blood vessels in laparoscopic surgery.